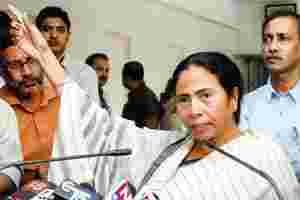 Kolkata: Ahead of her party lawmakers’ meeting with Prime Minister Manmohan Singh in Delhi on Tuesday over the fuel price hike, Trinamool Congress (TMC) chief Mamata Banerjee said her party will not compromise on the issue. “We will not compromise on the price rise issue, which is hitting the common man most. Our battle will go on. Our party MPs (members of Parliament) will meet the Prime Minister tomorrow (Tuesday), if he gives time, and express our grievances and listen to what he says," the West Bengal chief minister said. “There is also talk of increasing diesel and LPG (liquefied petroleum gas) prices. Trinamool Congress is a pro-people party. Already people are overburdened with rising prices. We are not going to accept it," Banerjee said. Her party colleague and Union minister Sudip Bandyopadhyay said before leaving for Delhi on Monday that “after a talk with the Prime Minister, we will return here on 9 November and report to party chief Mamata Banerjee, who will take the final call". According to Bandyopadhyay, Banerjee had complained that despite her repeated pleas, there existed no coordination committee in the UPA consisting of allies. Meanwhile, Union law minister Salman Khurshid on Monday said a solution could be reached during the proposed meeting of the Prime Minister with the key UPA ally. He also maintained that the government was “sensitive" towards the common man and the demands of the allies. “During the talks with Prime Minister Manmohan Singh, I hope they will understand some points and the PM can also make changes in the present system," he said, referring to the proposed meeting. The main opposition Bharatiya Janata Party (BJP) has stepped up the offensive against the government demanding an immediate rollback of the petrol price hike. It made a veiled threat of stalling Parliament during the winter session if the government fails to do so. The BJP also hit out at the UPA allies, saying they were “part and parcel" of the hike. “If the government wants the upcoming session to run smoothly, they must roll back the prices immediately... What we demand, what the people of this country demand is to roll back the petrol hike because there is no justification," BJP spokesperson Prakash Javadekar said.